If you are not a member of the Order of the Arrow, or if you are a less-than-active member, this section may be helpful in understanding the relationship between the OA and your unit. If you need more information than what is shared here, please feel free to email the Staff or Lodge Adviser (their email addresses are available from this site). What is the purpose of the OA? How do Boys Participate in the OA? OA members in your unit should participate in all activities that they possibly can to get the receive the most benefit from the program. This includes attendance at local monthly Chapter meetings in your District, as well as events of the Lodge that happen throughout the year. Additionally, some boys may take on the task of being ceremonialists, or on the Lodge Dance or Service teams, or special committees which may require attendance at other Lodge business meetings. Certain youth will be elected to Chapter and Lodge Office annually to facilitate the business of the Lodge as it pertains to the Council. But OA members can also be active members of the OA in your unit, as a Troop or Team Representative. the Troop Rep position is a recognized leader position eligible for use toward rank advancement, HOWEVER, the job entails more than bearing the patch. 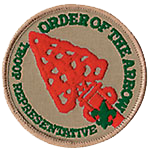 Boys who are selected by the Senior Patrol Leader to be the Troop/Team Rep are required to attend theit monthly OA chapter meetings, and to report on OA happenings to the Troop. Additionally, the Troop/Team Rep position should also promote the Order to other OA members in the unit, encouraging participation in OA programs and more. You should have the Troop Rep be accountable for their activity during their tenure in order to qualify for the leadership requirement. Which is the Priority? Troop or OA? The OA is very clear about this issue, and has been for its nearly 100 year history, the unit comes FIRST. If there is a scheduling conflict with OA and unit acitivities or meetings, the Unit activity or meeting takes precedence over any OA activity. Every youth member of the OA MUST be registered with a Scout Unit, they wear no official OA officer patches as their membership in BSA is solely through the unit, and the only officer patch they are allowed to wear on their uniforms is the officer they are serving as in their unit. Additionally, Units should consider the Lodge calendar (printed annually in the official Council Calendar booklet, and available on this website) when planning their events. The attitude should be one of compromise in meeting schedules commitments and conflicts. Continually scheduling unit activities that deliberately conflict with all OA activities is not only wrong, it is un-Scout-like. If we had a dollar for every time in the past 50 years that a SM somewhere said this…well, in actuality, the OA will NEVER ask a youth member to participate in OA over their unit participation. In fact, SMs feel that when older youth that are less active in the unit are OA members, they assume that the OA is stealing their participation. OA boys are generally older scouts (usually active boys in the OA are between the ages of 14 and 21), the same age group as boys who are starting to be less involved in unit activities and more involved in outside activities, such as school and sports. The OA actually retains boys in Scouting. By offering a rewarding program entrenched in service and leadership, boys migrate to OA activities, which in turn, keeps them active in their units, as opposed to just dropping out because of other conflicts. More active OA members are Eagle Scouts, and most will continue to be active until their 21st birthday, and will eventually become Scouters later in life. Their OA memories will be strong and happy, as will those of their time spent with their unit. Finding a good middle ground between OA and Unit activities is the best for any active OA youth in keeping them interested in Scouting. This is not a myth, in fact there is a good deal of truth to this issue. SMs DO qualify boys to be eligible for election to the OA. The qualification process is a confirmation that the basic election requirements have been met for nights of camping, First Class rank, and long-term camp requirements, IN ADDITION TO the SM determining if the Scout demonstrates Scout spirit. While eligibility should never be a “rubber stamp,” SMs should be mindful of a boy’s ability to serve, their desire to be an OA member, and understand that being an active member of the OA will benefit most youth through our servant leadership methods. It is VERY IMPORTANT that if the SM is precluding a boy from being put up for election one year, the SM MUST give a reason to the youth BEFORE the election. Also, SMs cannot determine the outcome of an election, rather only determine eligibility prior to the election itself. More information about election and our practices are included elsewhere on this site. The OA program is Nationally recognized as an official unit of the BSA. No unit may preclude OA activities nor deliberately disallow elected boys from participating in OA functions. Additionally, the OA Lodge is an officially chartered unit of the Boy Scouts, chartered by the local Scouting Council, it’s ultimate leader is the Council Scout Executive. The OA program is a decidedly important program to the BSA in developing leaders, and building character in today’s youth, with the full support of the Council. Additionally, the OA benefits the local Council by providing several hundred manhours of service to Council facilities each and every year. Sure, you’ve got your hands full, being a SM, weekly meetings, monthly outings, monthly business meetings, then there’s Roundtable, really? How am I supposed to be a supportive conduit for Scouting and OA outside my own unit? No one can speak to your own time and energy constraints other than yourself. It is important for the OA/Unit relationship to work, you or an aply qualified replacement adult should find a moment to attend some of the OA activities each year. Chapter meetings are a good start. By you setting the example in your unit, youth will follow you to these meetings and events. Your unit can be the spark that keeps OA programs fully functional throughout the year in your District. These events include staffing of District Camporees, Summer Camp Staff, Cub Scout activities such as Arrow of Light ceremonies, Den Chiefs and Cub Day Camp, plus so much more. Your involvement, and mostly YOUR ENCOURAGEMENT will help OA thrive in your unit and your District. If you were elected a member when you were a youth, you will especially appreciate the OA program now as an adult. The reward of participating alongside these young men forging their future, running their program from the bottom up, and bonding in life-long friendships with their brothers are only part of the benefits of OA. If you were never a youth member, no problem. As an adult, you can certainly have a great time in your Chapter. There’s always a need for adults to lend a hand for the program.